It's still hard to snag a table at this very popular Taiwanese eatery, so you will usually have to call in days ahead for a reservation or patiently wait in their small lobby for a table. Why is it so popular? They offer a variety of local favorites, including and finger foods like Taiwanese spring roll or run bing and the pork "sandwich" gua bao (my two personal favorites). The gua bao (pictured above) has slices of fatty & lean braised pork, pickled vegetables, cilantro and ground peanuts inside a steamed bun that gives it a simultaneously sweet, sour and savory bite. Done right, everything melts in your mouth and you don't mind that you're basically eating pork fat. I've also had it recently at the NY NY Food court and I have to say Shin Yeh does it much better. The run bing is a spring roll with sprouts, vegetables and meat (sometimes egg and other things too) with a sprinkling of ground peanuts wrapped inside a thin-crepe like wrapper. Because it's not fried, it's not greasy and you can devour a few. Almost every time we've come, we've ordered the sweet potato porridge. The last time, my mom also ordered taro porridge, but I don't like taro, so I didn't try any. If you don't feel like porridge, they also have great stir fried pumpkin vermicelli and fried rice. To go along with the carbs, we typically get sauteed liver, kidneys, various veggies. I also started ordering the buttery steamed cod after my friends ordered it a few visits ago. I was a bit disappointed by the beef with garlic this time, as the beef was a bit tougher than usual. If you want more than the free mochi that they offer up at the end of your meal, you should give the hot almond milk with fried chinese doughnut a try. Dip the you tiao into the milk and crunch away. Yum. A lot of people also like the almond tofu here, which is a bit chewy made with gluten flour, but I prefer old school style and not chewy. Overall, the portions are on the smaller side, so you can order more dishes to share since everything on the menu is pretty good. It's basically the nice place you would take your guests to give them a taste of local cuisine or where you take your relatives for a nice dinner out. The menu is in English and Chinese with random pictures and the atmosphere is family friendly or business meeting friendly. Not so romantic, just because it's so packed and crowded with other people's conversations. For a similar menu, but younger vibe (and extensive alcoholic drinks menu), you can check out Shin Yeh Table (to be reviewed). Kid friendliness: try keeping your kids away from this sweet treat! you probably have to get them their own, or at least their own spoon. 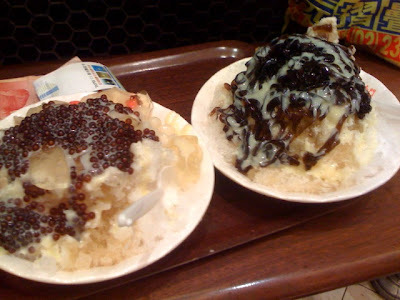 Can you believe that before Little South Gate offered shaved ice that there wasn't really any decent place to find shaved ice in the area? That's probably why you'll usually find a line snaking around the counter of people waiting for their cold desserts in the air conditioned basement of the Taipei 101 Mall (or whatever mall you might spot this chain) before they head out to the hot weather. Of course there are other hole in the walls that you can find it cheaper (and possibly better), but this will more than satisfy your cravings while you are shopping/showing around your friends/eating lunch while fighting off people who want your seats on the weekend crowds without leaving the mall. It's a summertime special that they've recently started offering along with their do hwa, but at higher prices (and profit?) maybe they'll keep it on permanently after all the Love Boat kids and summer tourists leave town. Figure out what you want while you are waiting in line or the servers will bristle at your slowness with all the people waiting behind you. Point at the pictures on the wall or at the stuff in the containers. A few seconds of the whirring of the ice machine and you'll get to dig in. I would eat this every other day if I could. A lot of variety and even some fresh made to order options in this Japanese buffet by uber popular Taiwanese eatery Shin Yeh. Suitable for large groups, families, or even a party of one, if you like Japanese food, you should be able to find a lot of things to satisfy your stomach. Granted, it has been over a year since I've eaten here, but I still remember sitting at the extra long table with my grandma, cousins and relatives, each taking our turn at wandering around the hot and cold food sections. Isn't that what most of our memories are about? Not necessarily what we ate and how it tasted (unless it's an amazing meal), but who we were with and how we enjoyed spending time with each other. My favorite part of the buffet was probably getting the made-to-order handrolls and getting an extra spoonful of bright orange masago (raw fish eggs) in my handrolls when I asked. If you've never had masago/tobiko, the bright orange miniscule eggs are like the Pop-Rocks of sushi. As kids, we would squeeze the saltiness out of each egg or smush them between our fingers. There's a sort of crunchiness and taste of the ocean that you get when you eat it, without it being TOO salty like the larger ikura. YUM! It's definitely a step up from Todai, (those in California and the states might be very familiar with), a popular all-you-can-eat Japanese buffet with everything from piles of seafood and rows of sushi to Americanized chicken teriyaki and stir fried noodles because it offers more authenticity and freshness at a better price. There's a lot of options to satisfy even if you don't want to eat sashimi. But if you like sashimi, load up your plate and grab the wasabi. Even better than having it sit out all night, you have to request (or point) to what you want, and the sushi chef will slice it up for you. You can even grab a teapot of mushroom soup, which offers a light broth. Of course, one of the best things about buffets is getting to sample more than one dessert. I love creme brulee with its crackable hard layer. This of course is just a random sampling of all that was there... I was too busy eating to take a picture of everything! Writing up this post makes me want to visit there again soon. If I do, I'll let you know if it's changed or the locations are different. Kid friendliness: kids meal offered; high chairs available. My girlfriends had been telling me about Aubergine for awhile and finally we all got together to have lunch there. In Chinese, the name is "Eggplant Curry" which is kind of funny since there isn't any eggplant on the menu. Aubergine is a chain restaurant that offers variations of two of the most popular Japanese dishes- curry and omelette rice. If you've never had Japanese curry before, it's slightly sweet and savory, but not as sweet as Thai or Indian curry. Also, you can have the curry with stewed meats inside the curry, or separate on top of fried pork, chicken or seafood. Omelette rice is basically a delicate layer of egg enveloping stir fried rice, shaped like an omelette. Once we got the menus, everyone gasped, "you have to order the Cordon Bleu curry (NT$250)," "it's my favorite," "I always order this". All but one, who said she usually always got the chicken curry, but even she was converted by everyone's enthusiasm. The picture in the menu looked promising, even though I'm not that crazy about cheese and ham stuffed inside my katsu. It's the one with the cheese stringing between the pieces of fried pork cutlet on the bottom. I wonder if the waiter thought we were funny that all five of us ordered the same thing. The menu has a picture for everything with English, Chinese and Japanese for each item, making it very easy to order. There's also a complex series of diagrams on the bottom, which is essentially the add-on options for your meal. You can add a drink, salad or soup (or two or three options) for varying prices, and you can choose from their options (caesar or mixed salad w/ thousand island or japanese dressing; onion or cream of mushroom soup). The drinks are quite sweet, even the ice tea, and they have options like mango, lychee or passion fruit juice. Maybe it's to balance the spiciness of the curry? As for the spiciness of the curry, there is a scale of 1-5 for how spicy you'd like your curry. I ordered a 2, but it was still a bit too spicy for me. It's definitely got a kick, but a few of my friends ordered 5 (the spiciest). So if you like heat, you should try it out. The starters come fast and the service is pretty efficient. The salads are simple, the soups are better. The curry comes separately in a silver pouring bowl. I like to pour mine on top of my rice and the cutlet. Somehow I always eat a lot of rice when I'm eating curry. The Cordon Bleu was not as cheesy as I thought it would be, but overall it was a pretty decent katsu curry. I liked it enough to take my mom over a week later when I couldn't figure out where to eat. My mom is a vegetarian so that eliminates a lot of places I like to eat that use solely beef or chicken broth in their soups (such as Pho Hoa or Dubu House). This time I wanted to try out their omelette rice with fried oysters (NT$260). I think this is the first time I've actually ordered it. I've lots of bites of friend's plates, but I've never felt the urge to order it in the food courts, where it seems to be everywhere. The kakifry (fried oysters) was good, but two were not enough for me. If I ordered it again, I'd probably get it with pork cutlet. I admired how the chef got the thin layer of egg around the rice and onto the plate without breaking the delicate skin. The egg is well done on the outside, but still silky on the inside. I requested a level 1 spiciness curry to go with it, though I think they have a tomato/ketchup based sauce with the omelette rice usually. The rice is a bit sweet, as if stir fried with ketchup or something similar, with diced onions, ham and corn. I think the onion flavor was a bit too strong. My mom liked her Curry with Mushroom Bonanza (NT$190). Haha, that's the official name. You can't tell from the picture, but there's different kinds of mushroom in the mushroom curry. The kid's meal is also fun-served in a combo plate shaped like a car, it's definitely a kid pleaser. It had fried rice, some fried pork, french fries, hamburger and broccoli. And a dessert! Which is dangerous to have it all on the same plate, since the kid will probably want to just eat the dessert first. I wasn't in awe of the food as I was with Saboten's tonkatsu, but at least here, you don't have to wait and there are more options, especially for vegetarians. Another good (and cheap!) tonkatsu option is Kitaro. The Bistro 98 space is great for people watching if you get a seat near the window. The first time we went, it wasn't crowded at all and my friends said that Aubergine used to be more popular when it first opened. The second time we went, it was almost full, with lots of large groups and families, making for a lively atmosphere. Even though I've found some great Korean restaurants in Taipei, you can't compare them to the real deal in Korea. I got to visit Seoul for the first time a few months ago for a very BRIEF trip, but I still got to explore a little bit and eat some good food. First of all, how come there is a Krispy Kreme in Seoul and not in Taipei?? Someday soon, maybe. And how awesome and random that they were handing out FREE donuts when we walked inside- of my favorite- the original glazed donut, hot off the roller/fryer. It seemed to be good for business, as people still left with boxes of other donuts and we were licking our fingertips of the sugar. As we wandered around Myeongdong (the Ximending in Seoul), I spotted international brands left and right, not only for clothing, but also for eateries, as well as a few cute little bistros and even a breakfast diner that we've seen pop up recently as well in Taipei. I even spotted a Coffee Bean and the Japanese tonkatsu chain Saboten which is popular in Taipei. There's also quite a bit of street food- fried delicacies, tempura, spicy rice cakes. I just didn't have enough time to browse and buy everything. I headed straight to my favorite stationary shop in Korea- Artbox- to get a new stash of unbearably cute bags and notebooks (you can find the stuff in Taipei, but it's much cheaper in Korea) and then it was time to meet up with my relatives for dinner. Surprisingly, they can even do a decent Western breakfast. Granted, it was the Grand Hyatt in Seoul, but I've had some really bad experiences with Western breakfasts in Asia (specifically China!) The blueberry muffin was especially moist and I wanted to pocket a few for the road. Kid friendliness: high chairs available and some couch seating. kids meals avail too. Did you know there's a new Diner in town? And you have to wait here too for a table. SIGH! Otherwise, you can round the corner to Carnegie's for a meal (which I have yet to try, but I heard their breakfasts are decent). Okay, so actually the branch has been around for awhile, opened after the Diner expanded their original location. For the first month or two before the word of mouth spread, we were able to get a seat without too much of a wait. But now the word is out, so you should call at least a day ahead for reservations during meal times. There's table seating upstairs on the first floor and more loungy type seating and room for big groups downstairs in the basement. While I waited for my table inside during the typhoon rainy weather, the servers rushed past me with plates of hot pancakes and burgers, balancing them while they went downstairs. The burgers/breakfasts are still good. Check out my previous reviews for pictures and details about the all day brunch options as well as burgers. But today I want to declare my love for the Diner's pecan pie ala mode (NT$90). Served warm with vanilla ice cream, it's sticky, sweet and tastes ultra decadent as the crushed and whole pecans and carmelized sugar melt in your mouth. The slice is big enough to share, sort of. I shared mine with a friend after we had burgers, but once I took a bite I wished I could have eaten the whole slice by myself. (I also took a bite before I took the picture above). The apple pie (NT$80 plus NT$40 for ice cream) and brownie (NT$150) ala mode are great as well especially when served warm, but the pecan pie ala mode is the best deal! PS I really like how they designed their map. I wish I had the time to design something similar for all the restaurants I've reviewed. Kid friendliness: lots of options, relatively new and clean. If you're looking for a casual place with something for everyone, or you don't have a lot of time but want to have a tasting menu of Taipei eateries, you should head to Breeze at Taipei Main Station. And with all the MRT lines going through the Main Station, you could stop by before you head home or off to your destination. Essentially, it's a GIANT, full circle food court, with four main sections filled with lots of familiar eateries- Taiwan "Night Market" Chinese food; desserts/bakeries; Curries, and even a whole food court of eight different beef noodle soups shops to choose from. I guess you could have your own Iron Chef tasting if you wanted to. I'll have to give that a try next time. When we went, we walked around the whole thing to see what our options were, and then settled on trying out the section that seemed to be where all the non-Chinese/foreign options were- curry from Indian Fans, Sababa chicken pitas and Yokohama Station's fried pork tonkatsu and omelette rice. The bite of omelette rice and tonkatsu I had were forgettable. For some reason, my friend got some food from Indian Fans.The flatbread from Indian Fans didn't even look like naan, and the curry was watered down. I usually love Indian food, but the offerings on menu were not appealing to me- it seemed more adjusted to Taiwan flavors. I didn't see any tikka masala or saffron rice. This old Taipei Times article reinforces my gut reaction about the place. I'd rather eat at the other mall court staple, Indian Palace. There is a lot of seating for each section with wooden benches and you can even take your food from one section to the next if you really want to eat something different from your family/friends. Of course, you have to save room for dessert. The desserts section is a white, brightly lit mod area with options like Xiao Nan Men (Little South Gate) do-hwa, Meet Fresh, Pinkberry knock off Sweetberry, Beard Papa or Oishii cream puffs, Movenpick, Mr. Donut, or various bakeries. There's also Starbucks or Mr. Brown coffee if you need a caffeine burst. The pink and green branding of Sweetberry was just TOO similar to Pinkberry to not be a shameless knockoff. See the same shades of pink and green and similar font in exhibit number 1 from dessertbuzz.com! It's laughable that they even made the logo pretty much the same (but it's a heart). 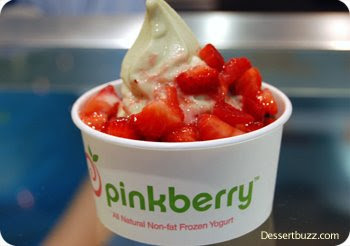 I guess since no one has heard of Pinkberry here, they thought they could get away with it. But I have! The expensive price for the extremely small portion (NT$80) and even smaller portion of fruit was a big disappointment. The flavor was appropriately tart (like Pinkberry) and yogurt-like, but I was shocked at the lack of strawberries. I'd stick to the Xiao Nan Men do-hwa or soy tofu custard. If you want frozen yogurt in Taipei, then you'll have to head over to Yogurt Me. Next time, I'd like to try Minder Vegetarian restaurant and some of the other desserts as well as the Beef Noodle Soup (Niao Rou Mien) section.